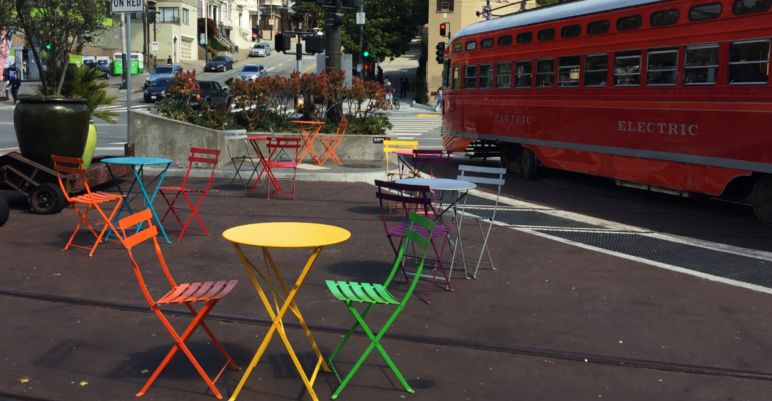 Jane Warner Plaza, located at the intersection of Castro, 17th and Market streets, is a tiny green oasis that since its launch in the Spring of 2009 has become the most popular meeting place in the Castro district. Surrounded by a thin screen of trees and flowering plants in planter boxes and furnished with cheery colorful café tables and chairs, the plaza is a perfect place to sip a cup of coffee, chat with a friend, and watch the world go by. The first of three temporary public squares created by San Francisco’s “Pavement to Parks” project, the 17th Street plaza was a joint effort of the Department of Planning and Public Works and the Castro/Upper Market CBD. The CBD oversees and pays for maintenance and improvements of the space, provides the plaza’s tables and chairs, and volunteers water the plants and help out as needed. From its launch, the plaza was enthusiastically embraced by the community and in 2010 the small Castro green space that started as a temporary experiment received landscaping upgrades, was transitioned to permanent park status, and in a dedication ceremony received a new name, Jane Warner Plaza. It was named after a much loved San Francisco Patrol Special Police Officer, Jane Warner, who had recently passed away after a battle with cancer. Affectionately known as “Officer Jane” throughout the neighborhood, Warner walked a police beat encompassing the Castro and two adjacent neighborhoods for 20 years. She was firm about keeping order and maintaining a safe neighborhood but was loved for her warm smile and helping hand, which she extended to many down and out young persons. Jane Warner spent two decades keeping the peace in the city’s Castro, Noe Valley and Mission neighborhoods as a San Francisco Patrol Special Police Officer. To her many friends, she was known simply as “Officer Jane”. She was dedicated not only to the business owners who contracted with her for neighborhood safety services, but also to protecting the residents and visitors in the area she patrolled. She was a long time columnist for the Bay Area Reporter, penning the LGBT paper crime column. Her career began in Hawaii, first as a Deputy Sheriff and later as a undercover police officer for the Honolulu Police Department. In 1991, she became the first woman and out lesbian officer in the San Anselmo Police Department in Marin County. In addition to her love of law enforcement, Jane Warner had a soft spot for animals and dogs in particular, captured her heart. The City and County of San Francisco dedicated the Jane Warner Plaza on what would have been her 54th birthday, November 7th, 2010.